Reiner Gläss isn't an inventor in the typical abstract meaning of the word, a character like Daniel Düsentrieb. Reiner Gläss analyses with his increasing knowledge and experience and questions facts that most people simply accept. This questioning develops into a process which begins with understanding the basic process and leads to a producible prototype or straight into a small series product. Reiner Gläss is an inventor. He lives and works in Baden-Württemberg, just like Messrs Bosch and Daimler and numerous engineers, technicians and craftsmen that over the years have transformed this area renowned for its picturesque countryside into an area equally famous for researchers and developers. Perhaps it is the specific local mixture of clear analysis, surprising ingenuity and the enterprising spirit that has led Reiner Gläss to develop and market his inventions. A solid precision mechanics apprenticeship at Carl Zeiss enabled Reiner Gläss to realise his good ideas in adequate quality. His distinctive feeling for design has been reflected by unique functional and attractive products that are respected all around the globe. LPs are precious: Not only for their excellent sound quality but in many cases as irreplaceable collector's items. Even when great care is taken, over time it becomes inevitable that they become dirty. Careful cleaning of discs is particularly important to preserve their value. 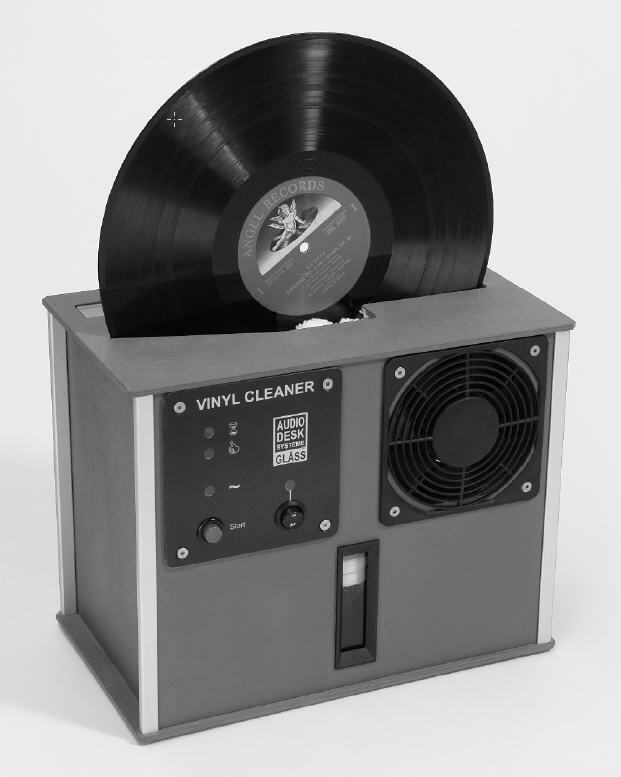 Rainer Gläss from Audiodesksysteme has developed a professional yet comfortable LP-washing machine, the „Vinyl-Cleaner". The washing machine works fully automatically and is very easy to use. The disc is inserted into the machine's opening vertically from above and the red button is pressed. The gentle cleaning process runs fully automatically during which time the yellow LED lights up. When, after a short period of time, the green LED lights up the cleaned disc can be removed from the apparatus. Counter-rotating micro-fibre cleaning barrels and ultrasonic waves softly remove even deep-sitting dirt particles from the grooves of the LP. When in operation the machine permanently filters the cleaning fluid. Two extremely high-performance motors guarantee effective yet quiet drying of the LP.